Another mega shopping destination has opened in Dubai offering designer brands at discounted prices in a luxury setting. Bargain hunters and fashionistas are already flocking to The Outlet Village in the Jebel Ali district, phase one of which opened this month. Modelled on popular European outlet villages and with an environment inspired by the pretty hilltop town of San Gimignano in Italy, which is a UNESCO World Heritage Site, the retail haven currently spans some 140,000 square metres according to developer Meraas. Additional phases will add up to 300,000 square metres to The Outlet Village, with facilities including retail outlets, family attractions and dining outlets. There are 125 brands already on sale at the village, including DKNY, Dunhill, Guiseppe Zanotti, Ted Baker, Tommy Hilfiger, Diesel and BCBGMAXAZRIA. They are housed in individual boutiques alongside multi-brand stores such as Priceless and Etoile that will sell designer brands including Fendi, Tom Ford, Jimmy Choo, Valentino, Tory Burch, Givenchy, Dolce & Gabbana and Kenzo. Food outlets include PF Chang’s, Operation Falafel, Urban Seafood Tashas, Godiva and The Brass. In a departure from the mall norm, terracotta bricks, placed in a sophisticated curved formation, line the floors of the mall, which boasts Italian-themed interiors. Rickshaws selling gelato are also to be found across the mall, in a nod to the Tuscan town. 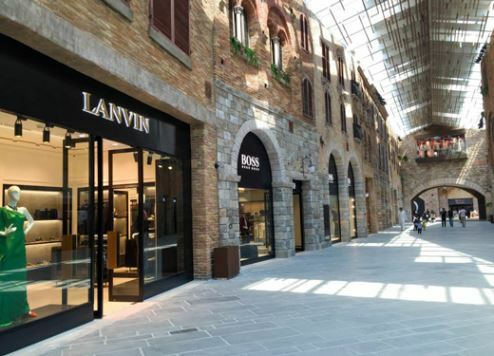 The Outlet Village is open from 10am to 10pm, Sunday to Wednesday, and 10am to midnight, Thursday to Saturday. A complimentary bus service runs from the mall to popular tourist spots in Dubai including The Beach at JBR.